Two boys, one aged 23 months and the other aged 10, have died in a hit-and-run car crash in Wolverhampton. They were in a BMW being driven by their mother when it crashed with an Audi S3 on Birmingham New Road at about 20:45 GMT on Thursday. 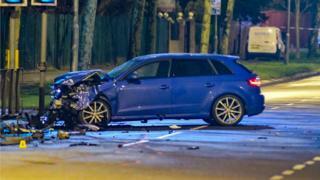 The driver of the Audi left the scene and police have urged them to come forward. A witness said his son saw two vehicles “racing” near the scene before an “almighty bang” was heard. The 31-year-old driver of a third car, a Bentley, was arrested on suspicion of causing death by dangerous driving. Ambulance crews arrived at the Lawnswood Avenue junction to find members of the public tending to the injured. Paramedics tried to save the children but they were pronounced dead at the scene. The mother, whose injuries were not life-threatening, was taken to the major trauma centre at Queen Elizabeth Hospital in Birmingham. West Midland Police confirmed the speed of the vehicles involved is being investigated. The witness, who lives nearby but did not want to be named, said the BMW was hit shortly after his son saw two cars apparently racing towards the junction. “I didn’t see it but I heard it – two cars must have been racing,” he said. “My son ran to the window and said ‘they are racing dad’ and then we heard an almighty bang. A local care worker, who asked not to be named, said several crashes had occurred at the junction in the past 18 months because of motorists passing lights on red. Det Sgt Paul Hughes, from West Midlands Police’s serious collision investigation unit, said: “I would appeal directly to the driver of the Audi to make contact with us. Police have also urged people who saw a white Bentley Continental convertible and a blue Audi S3 travelling along Birmingham New Road around the time to get in touch. Det Sgt Hughes said the investigation was in its early stages and the family was being supported by specialist officers. The crash happened on a road covered by an injunction forbidding people from so-called car cruising. Prohibited activities include speeding, driving in convoy, racing and performing stunts between the hours of 15:00 and 07:00. The road was reopened at 03:40 GMT.